Landlords still reeling from the changes in the tax system removing the ability to deduct mortgage interest from their costs of their property portfolio for higher rate tax payers announced in the Budget. Latest reports in the Telegraph have indicated that some landlords have responded by incorporating their rental businesses and tranfering their property portfolios into a company. Companies are not governed by the same restrictions affecting individual landlords. Companies House indicate that 4560 property companies have been incorporated in the past 3 months alone. This is a rise of 50% on the level seen a year ago. Corporate landlords will also benefit from falling rates of corporation tax which is due to fall to 17% by 2020-21. We recently looked in details at the tax advantages to a landlord by incorporating your property rental business. In summary, it is very difficult to generalise as each landlords portfolio and gearing is very different along with their other financial commitments. As a Director of several limited companies I know full well the extra burdens, cost and time wise that incorporation involves. For many small scale landlords with just a couple of properties the incorporation route is unlikely to be worth doing. However, those landlords with portfolios and loan costs that a larger and who are comfortable with corporate requirements it's something that is worth a serious look. Will Chancellor act to close loop hole? The question remains that if the Chancellor sees that landlords are side stepping the latest changes then will he legislate again to restrict the opportunities of landlords have to avoid the latest tax increase. Recent experience has shown that the Chancellor is not scared to act against landlords to raise more tax. The Office for National Statistics (ONS) House Price Index (HPI) for January 2016 has been released. It puts annual UK house price inflation at 7.9%, with England at 8.6%, -0.3% in Wales, 0.1% in Scotland and 0.8% in Northern Ireland. England's growth is still predominatly driven by the South East, at 11.7%, London 10.8% and the East at 9.8%. Excluding London and the South East, the rest of England saw annual growth of 5.1%. The UK average mix-adjusted house price is now £292,000. Most experienced landlords are pretty aware that things always come together. Life rarely comes in bite size chunks especially when you are a property entrepreneur. You tend to find the boiler blows up, just as a tenant decides to move out and another stops paying their rent, then there is a leak! This very much mirrors my experience at the moment. It's no exaggeration to say that for me the 1st of April is D day. Currently, I've got one sale going though. This is not just a sale; it's the third time the sale has been agreed on this property since I first put it on the market about a year ago. This time it's a cash buyer looking for a buy-to-let and so is desperate to avoid the additional 3% stamp duty surcharge that the Chancellor in his wisdom has decided to slap on landlords. Just to throw an added complication into the mix I have a predatory freeholder Southern Land Securities and there managing agent Hamilton King who are trying to extract their pound of flesh by getting me to sign a deed of variation ramping up the ground rent and clobbering me with a range of disbursement charges and legal fees at the same time (more on this shortly). On top of the above I am frantically trying to agree the purchase of a Peak District holiday home. Not just a holiday home but also a property that will help secure the long-term viability of my rapidly expanding food and drink business. Added into this mix I have the freeholder of my Penthouse bearing down on me threatening legal action because I have not reinstated a 'bloomin' spiral staircase within the allotted 3 month time period. Added to all this it's April fools day. I suspect somebody 'up there' is having a massive laugh at my expense. So this Easter I will be either celebrating big style or will be wearing a proverbial Easter egg all over my face! The first landlord has been prosecuted by Waltham Forest council for failing to obtain one of its 'Private Rented Property Licences'. The Private Rented Property Licencing scheme was introduced by Waltham Forest council last April. The mandatory scheme covers all privately rented homes in the borough. Landlord, Coral Dawkins pleaded guilty to the charge of not having the required licence for a rental property in Leyton, despite the council sending her a number of warning letters. Thames Magistrates Court handed Dawkins £800 fine, costs of £637.31 and a victim surcharge of £80. A 5 year licence is £500 for a single dwelling. Without trying to sound too 'Dragon's Den', but this bit of BBC research into Haringey Council's not-for-profit letting agency hasn't come as too great a shock to my business radar. Why would a council think they could enter, what is just about the UK's most competitive industry and bring down costs? The BBC have done some sniffing around at Haringey Council's letting agency, Move51⁰ North. The agency, started in October, claimed it would 'offer homes at a fair rent to locals'. Sadly, BBC has revealed that the agency currently only has one house on its books. This would be funny, if it wasn't for the ridiculous cost to taxpayers, of money that could be far better spent doing something worthwhile. The Beeb claim the council has already spent £200,000 on setting up their agency, and say the council forecasts another £1.37m will be required to fully establish it. On the books, a director, a junior consultant and a property manager with salaries of £30,000 plus. You can imagine the talk in the office, - "Can I take this viewing? ", "No can I?" "Please let me!" Have Tories knifed us landlords? Landlords may be feeling rightly aggrieved over latest Government changes to the tax system. After many of us have voted for the boys in blue to keep the red peril out with their crazy talk of rent control and landlord licences we instead feel the cold metal between our should blades as the Telegraph put it that we have been knifed in the back! The latest Budget has announced a hike in the relative capital gains rate paid by landlords. In effect it is not quite so bad. The latest changes actually reduce the CGT rate significantly from 18% to 10% at the lower rate. However, this reduction in rates does not apply to property and therefore landlords. The cumulative effects of the penal stamp duty rate, higher relative CGT rates for property and the removal of interest rate relief for higher rate paying landlords has felt like a thorough beating for landlords over the last couple of years after the election rhetoric indicating no or little action in the private rental sector. Stepping back from my slight sense of betrayal by the latest Government action. If landlords look at what the Government are trying to achieve. Having lost control of the economic lever of interest rates (they can't raise them because of the threat of putting the entire economy into a tail spin) they are attempting to poor a dampener on the overheating property market particularly in London and the South East with more direct fiscal measures. The measures look to reduce the amount of investment by landlords through making it fiscally less attractive and at the same time raising additional revenue from landlords who are largely making record profits. If these tweaks around the margins of property taxation ensure that the economy stays on an even keel then reluctantly it is something that I may have to accept. In my mind it is far less restrictive and divisive than rent controls and a pointless mandatory licensing scheme #hobsonschoice. A picture can paint a thousand words...take datestamped photos at the start and end of every tenancy. The Chancellor has confirmed that the surcharge on buy-to-let properties will be extended to larger landlords too and will now apply to landlords who buy more than 15 properties. Reports indicate that this change will raise stamp duty charges for all landlords large or small. For example, a landlord who brought a £200,000 buy to let would currently pay stamp duty of £1500. Following the changes confirmed in todays Budget the cost from the 1st April will be £7,500. Some commentators have argued that this change will put the build-to-let initiative in jeopardy. Personally, I think it would have been unfair to treat large landlords from smaller ones. Why should the big boys have the benefit of a big tax break! Arguably, though there is another debate. Should landlords pay more to purchase the same property compared to other purchasers? To me this will distort the functioning of the housing market in the long-term and will have a range of unintended consequences affecting the whole housing market. 2016 is likely to be a steady year for the buy-to-let mortgage market, following on from a successful 2015 which saw an increase in the number of lenders and products available to landlord clients. Although the impending tax changes could cause some dampening of the market and may deter amateur landlords from investing in rental property in the UK, it is expected that professional landlords will adjust to the new tax regime and continue with their buy-to-let property businesses. As professional landlords are running their businesses to make a profit, it is reasonable that they should aim to maximise the return on their property investments. For this reason, some landlords choose to purchase Houses in Multiple Occupation (HMO) which can often deliver higher rental yields than standard buy-to-let properties. Standard properties earn between 5 and 6 percent rental yields whereas HMOs can earn around 9 per cent, on average. An HMO is defined as a house or flat which is let to 3 or more tenants who form 2 or more households and who share a kitchen, bathroom or toilet. As an HMO contains multiple tenants, the landlord is able to receive more rental income for one property which accounts for the higher rental yield. However, despite the potential rewards for investing in HMOs, it remains a niche area in the buy-to-let sector. Some landlords are hesitant about dealing with the additional obligations involved including HMO licensing laws and the maintenance requirements for such a property. Mandatory licensing affects all HMOs that have three or more storeys and are occupied by five or more persons forming two or more households. However, each Local Authority may also impose additional discretionary licensing which varies widely around the UK. Landlords should apply to the relevant Local Authority for a suitable licence for each of their HMO properties. Many HMO properties service the student population who are sometimes perceived to pose a higher risk of damage to property and being unreliable tenants, although there is no real evidence to support this. However, it is prudent for landlords to anticipate maintenance costs for all of their buy-to-let properties, including HMOs, and budget accordingly. For those landlord clients who are looking for an HMO buy-to-let mortgage there are plenty of options available to them. Axis Bank entered the market last year offering a range of specialist buy-to-let products for HMO properties, although applicants must be experienced landlords with at least three existing buy-to-let properties. Axis will consider a maximum of 6 bedrooms, non-licensed HMOs, individual ASTs and up to 75 per cent loan-to-value. Fleet Mortgages will lend to landlords with a minimum of 3 years’ experience, up to 75 per cent loan and will accepted multi-unit blocks with up to 10 self-contained units. HMOs must be licensed where required and properties with 2 kitchens will also be considered. Paragon Mortgages remains one of the key lenders for professional landlords with HMO properties, offering fixed and variable rate products up to 75 per cent loan-to-value. Paragon will consider up to 20 tenants with multiple or single ASTs and assess the rental income on a room by room basis. Paragon has a maximum new lending aggregate of £5 million. Kent Reliance is also a popular lender for HMO properties with an unlimited aggregate lending policy for professional landlords and the only current provider of 85 per cent loan-to-value mortgages. Kent Reliance also has no minimum income requirement and accepts first time landlords. Other lenders servicing the HMO sector include The Mortgage Works, Leeds Building Society, Precise Mortgage and Shawbrook Bank. Axis Bank – 3.99% 2 year fixed rate up to 75% LTV with a 1.5% arrangement fee. Rental calculation of 125% at 5%. Fleet Mortgages – 4.19% fixed until 31/05/2018 up to 75% LTV with a 2%arrangement fee. Rental calculation of 125% at 5.59%. Kent Reliance – 5.39% fixed for 2 years up to 85% LTV with a 2.5% arrangement fee. Rental calculation of 130% at 5.74%. Leeds B.S. – 2.49% fixed until 30/06/2018 up to 70% LTV with a £1999 arrangement fee. Rental calculation of 125% at 5.99%. Paragon Mortgages – 4.10% fixed until 31/03/2019 up to 65% LTV with a 1.5% arrangement fee. Rental calculation of 130% at 7%. Precise Mortgage – 4.29% fixed until 30/04/2018 up to 75% LTV with a 1.5% arrangement fee. Rental calculation of 125% at 5.01%. The Mortgage Works – 3.14% fixed until 30/06/2018 up to 65% LTV with a £1995 arrangement fee. Rental calculation of 150% at 4.99%. Osborne confirms the 3% Stamp Duty surcharge on second homes, publishing the response to the consultation doc: Higher rates of Stamp Duty Land Tax (SDLT) on purchases of additional residential properties . In response to 'The proposed exemption for large scale investors', Osborne has confirmed - they won't be. So all property investors, great and small will be subject to the 3% Stamp Duty surcharge on second homes. Those buyers who own property outside England, Wales or Northern Ireland, will find themselves subject to the surcharge when buying a home in E, W of NI. Obviously, this will not occur in reverse, so those of you looking to buy their 'Escape to the Sun' property will not be faced by these surcharges, just those taxes under that country's specific jurisdiction. Buyers will have 36 months to dispose of a property if they are in the process of buying and selling their primary residency, leaving them with two or more properties at the end of the day of the transaction as part of the moving process. To avoid the surcharge property purchases need to be completed before midnight on 31st March 2016. Any transactions where contracts were exchanged before 25th November 2015 will not be liable either, even if their completion falls after the April 1st deadline. Osbourne hopes his ARSD will generate £3.7 billion for the Treasury over the next five years. It's good to share, and even better now, thanks to two new tax-free £1,000 allowances starting from April 2017. Firstly, and the one that most relates to landlords, involves income from property, such as renting a driveway or loft storage. – £1,000 will be tax free, although the presumption would be the landlord would have to have the property classified as their primary residence. The second £1,000 tax-free allowances relates to selling goods or providing services - such as sharing power tools (and many landlords have an array of tools and machines acquired over the years, lift sharing ( not so relevant) or selling goods they have made. Starting from 17th March 2016, the calculation for stamp duty on freehold commercial property and leasehold premium transactions will change. Rates will now apply to the value of the property over each tax band, at 0% for the portion of the transaction value up to £150,000; 2% between £150,001 and £250,000, and 5% above £250,000. Stamp duty rates for leasehold rent transactions will also change with a new 2% stamp duty rate on leases with a net present value over £5 million. Today's tweet from the Government, a response to Channel 4's Dispatches programmes focused on PRS. It appears fewer tenants can afford the luxury of their own space. Homelet's Rental Index records the shift away from single occupancy tenancies, towards multiple occupancy and family occupancy in the PRS sector. Homelet started tracking number of tenants per rental in 2008. In that time, Homelet have seen single tenant occupancy falling from 67% to 33% of tenancies. Over these eight years, their market has shifted towards 'multiple occupancy', with 'two tenant' occupancy growing from 28% to 52% share, and 'three or more tenant' occupancy growing from 5% to 15%. Homelet's Rental Index for February 2016 now has their average rent in the UK at £744 per month, compared to the average London monthly rent at £1,521. I recently had an email pop into my mailbox from a long-term tenant. She and her partner were giving me notice that they wanted to end the tenancy and are moving out. This news is disappointing They were good, trouble free tenants. Typically, it comes at a hectic time. I really haven't got the time to manage the check out, but I'll need to make time somehow. The general rule is that tenants have to give landlords 1 months notice of their intention to leave a rental property, whilst landlords, through the section 21 notice need to give 2 months. This belies a whole lot of detail which I have to remind myself about every time. Firstly, when it come to one months notice from the tenant, - it needs to be a clear month. Therefore, in my particular case my tenant emailed me on the 29th Feb informing me that they intended to move out on the 10th April. The tenancy in this particular case started on the 1st of the month, which means that I have received a clear months notice from my tenant. If I had not received notice until say the 2nd of March, whilst this would still be a over a months notice; because it is not a clear months tenancy period, the tenant would have been liable for rent until the end of April. So just remember, a months notice is a clear month - which is very different to 30 days! The Housing minister, Brandon Lewis, has written to all chief executives of local councils to ask them to stop advising tenants to 'stay put' when faced with eviction by their landlord. Many councils' have routinely advised tenants to wait until the bailiffs turn up at the door before leaving their rental property so that they can be accepted as officially 'homeless'. Landlords and tenants continue to raise concerns about local authorities advising tenants to stay when issued with a Notice seeking possession of a property let on an Assured Shorthold Tenancy under Section 21 (1) or (4) of the Housing Act 1988. The statutory Homelessness Code of Guidance, which local authorities are required by law to have regard to, is clear on this matter. It contains guidance on how authorities should treat homelessness applications in circumstances where a tenant has received a valid Section 21 notice. It says that housing authorities should not, in every case, insist upon a court order for possession and that no local authority should adopt a blanket policy in this respect. The Guidance states that if the landlord intends to seek possession and there would be no defence to an application for a possession order, then it is unlikely that it would be reasonable for the applicant to continue to occupy the accommodation. Well... let's see if any councils change their tune. The LSL property services House Price Index for February 2016 is out. “House prices flew forwards in February, with the average home value in England and Wales increasing 0.8% (£2,277) during the month, equal to an average increase of £79 each day. This is double the 0.4% monthly growth seen in January, which could be as a result of buy to let investors rushing to complete quickly to avoid April’s additional 3% Stamp Duty surcharge, which has also seen sales shoot up 11.8% since January. February’s house price growth is fantastic news for homeowners, particularly those considering cashing in on the additional demand and making the most of this sellers’ market. Typical property values are now £16,866 (6.2%) higher year-on-year; the fastest annual growth rate seen in eleven months, driven by the gulf in the number of aspiring home buyers, compared to the limited supply of homes for sale. “The East of England is outranking the capital with the fastest growing property prices of all regions, with a 7.2% uplift in the last twelve months. This pace is being fuelled by commuter towns, as London’s workers search for more affordable housing. The trend towards higher house price growth in cheaper areas can also be seen elsewhere. While house prices in Yorkshire and Humberside have remained flat on a monthly basis, property values in the City of Kingston upon Hull have hit a new record of £111,409, up 0.9% compared to the previous month, as the city has one of the lowest average home values in the country. The upswing in Hull’s home values is due to the increase in new jobs resulting in more demand, with major firms including Samsung lifting employment in the city. Recently winning City of Culture 2017 may have provided an additional boost to demand for property within the city, as the pickup in tourism supports the local economy as a result of the award. “In London, house prices have climbed 6.8% year-on-year, to reach £582,783. This rapid escalation means that the typical home in the capital is now worth £36,903 more than twelve months ago, exceeding the Londoner’s median gross annual earnings of £35,333. Most of this jump in house prices again occurred in more affordable areas, with property values in the cheapest third of London boroughs going up 14.5% in the last twelve months. Despite the upswing in the capital’s overall property values, sales have slipped 4.6% in the three months November 2015 – January 2016, compared to the same three months one year earlier. This is largely due to a lack of homes for sale combined with more caution at the top of the market, rather than a general decline in demand. Why have people stopped moving house? Labour's London mayoral candidate, Sadiq Khan, has set out his 10-point plan for office. Number one on the list - tackling the housing crisis, particularly the capital's Private Rented Sector. Sadiq pledges to create an online database of 'name and shamed' landlords. An idea taken from New York mayor, Bill de Blasio, who created an online database sharing the details of any landlords successfully prosecuted for housing-related offences. I'd not be against this, but as a matter of fairness, I'd suggest a database of tenants successfully prosecuted for housing-related offences could be housed on the same site - although I doubt this to be such a vote winner. He also wants to build more homes for renters, including “first dibs” for Londoners on affordable homes on mayoral land on a part-buy/part-rent basis. Let the back biting and tittle tattle begin. Freeze TfL transport fares for four years and introduce a one-hour bus ‘Hopper’ ticket, paid for by making TfL more efficient and exploring new revenue-raising opportunities. Londoners won’t pay a penny more for their travel in 2020 than they do today. Set up Skills for Londoners to ensure all Londoners have the opportunity to train in the skills that our economy needs. Landlords will face a 3% stamp duty surcharge from the 1st April 2016 because of the Governments proposals outlined in the Chancellors Autumn Statement. However the changes will not be formalised and given detail until the 16th March in the up coming Budget. This gives the Chancellor a chance to change his mind or water down proposals. His willingness to rethink was evidenced by the recent pension rethink. Will the Chancellor rethink his stamp duty changes? Some further proof that the BTL sector is experiencing a pre-April surge. Surveyors firm, Connells Survey & Valuation, have reported they carried out 34% more BTL valuations in February 2016 compared with February 2015. Re-mortgaging activity also jumped, up 41% this February, compared to last. “Buy-to-let investors and those remortgaging with the aim of buying a second home are racing against the clock. Activity from both these groups is picking up pace on a monthly basis as the 1 April Stamp Duty deadline looms and people hurry to complete their transactions before being hit by the 3% surcharge on their buy-to-let property or second home. Expect this activity to reach a crescendo in March before calming in the second quarter of the year. Buy-to-let investors will be calculating the impact the stamp duty hike is having on their rental yields, while those thinking of remortgaging to fund a second home will weigh up whether it’s still financially viable for them to do so. The second series of 'Nightmare Tenants, Slum Landlords' starts tonight at 9pm on Channel 5. The first episode features a landlord renting out a rat infested House in Multiple Occupation, and two others seeking rent arrears. The series runs for ten episodes, so if you're a fan, set your box to 'series record'. Lending data for Q4 2015 has been released by the Bank of England. It confirms the much talked about -'BTL mortgage surge', with BTL lending rising from £7.7bn in Q4 2014 to £13.2bn in Q4 2015. Gross mortgage advances totalled £63.1bn, of which 20.9% was to first time buyers, 15.9% was BTL. Do you want to purchase a buy-to-let property before the stamp duty increase in April? It is probably too late to expect a new mortgage application to complete before the end of March, but a unique bridge-to-let scheme with Aldermore could provide an alternative way to save you money and beat the stamp duty rise. The scheme includes a free valuation and if required offers an exit route from the initial bridging loan, ensuring costs and hassle are greatly reduced. Reeds Rain and Your Move's Tenant Arrears Tracker for Q4 2015 shows a fall in the number of tenants in arrears. The agents data shows 82,900 households owed more than two months’ late rent, in Q4, 2015, down from 84,200 in Q3 2015. Eviction orders fell slightly to 26,676 in Q4 2015, compared to 26,775 in Q3 2015, and 28,167 for the same period a year before. “Private renting is still absorbing thousands of extra households every month – housing millions more than just a few years ago. As this tenure of housing and this way of living grows, affordability is the issue that goes hand-in-hand with questions of capacity. Buy-to-let mortgage arrears also fell, with landlords in repayment arrears down to 5,500 cases in Q4. The number of buy-to-let mortgages in arrears has dropped by 54% since standing at 11,900 cases in Q4 2014. The DCLG's response to last nights Dispatches programme - Right to Buy Millionaires. For those who either didn't know or forgot, the London Landlord Show starts tomorrow, -Wednesday 9th March 2016 from midday to 7pm and then again on Thursday 10th March 2016, 10am to 4pm. Tonights dispatches reveals how council homes released onto the market by 'Right to Buy' have become a goldmine for a few shrewd investors. Channel 4's, Dispatches, Council House Millionaires is on at 8.00pm, Monday 7th of March. Teeside landlord, David John Wallman, received a suspended custodial sentence after trying to fix the gas supply at his rental property without the required accreditation. The tenant, Jeanette Saul had phoned Northern Gas after smelling gas at the rental property in Stockton. A Northern Gas engineer then attended, identified a problem and shut off the gas supply attaching a warning notice alerting people to the danger. That evening, the landlord arrived at the property and ignoring the warning notice, attempted to fix the leak before switching the gas supply back on. The next morning, the tenant still smelling gas, phoned Northern Gas a second time. A further Northern Gas engineer attended the property, capped the meter, then arranged for a Gas Registered engineer to complete the required repairs. Teeside Magistrates Court heard how the landlord, had previously been a Corgi-registered gas fitter, but his accreditation had lapsed in 2001, and although hehas since re-qualified, when he had attempted to fix the gas leak and switched the condemned gas supply back on, he was not. Walkman pleaded guilty to contravening health and safety regulations. The judge saw it differently - Wallman received a 26 weeks prison sentence. suspended for 12 months, a £18 victim surcharge alongside £789 in costs. The Association of Residential Letting Agents (ARLA) report a further drop in the number of rental properties advertised by its agents. On average each ARLA letting agent had 172 rental properties per branch in January - 10 less than in December. The figure is ARLA's lowest on record, though they have only been tracking it for a year. It's always worrying when landlords get a letter from the taxman. My latest correspondence from Mr HMRC was under the Let Property Campaign. 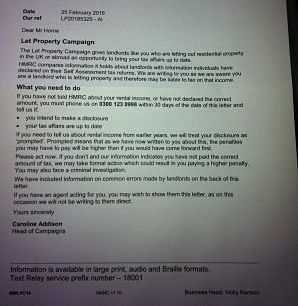 Has anybody else received this letter asking landlords to come clean on their property tax affairs? My conscience is clear but I'm guessing for many landlords it has the desired affect of spooking them into disclosing additional amounts of income. Watch out watch out there is a taxman about! Following on from Nationwide's latest HPI figures claiming annual growth now at 4.8%, the Halifax have published their February 2016 data, putting annual growth at 9.7% . That more than twice the Halifax rate, so using my befuddled logic, maybe the real rate is somewhere between the two, so, let's say 7.2% - it's as good a guess as any. Anyway back to the Halifax release. The bank reports prices in the three months to February were 9.7% higher than in the same three months a year earlier. "House prices in the three months to February were 3.0% higher than in the previous three months whilst the annual rate remained unchanged at 9.7%. So, does anyone else want to guess what the actual rate might be? A tenant satisfaction survey carried out by the NLA puts Wales landlords at the top. 92% of tenants surveyed reported being satisfied with their landlord, compared with just 67% of tenants in the North East. No doubt the Welsh Assembly will claim it reflects the measures they've introduced to help regulate PRS, as part of the Housing (Wales) Act 2014 such as Rent Smart Wales. The UK average was 79% of tenants satisfied with their landlord. Nationwide's HPI figures for February show a small acceleration in annual house price growth. House prices were up 0.3% in February, bringing the annual growth to 4.8%. * Seasonally adjusted figure. “UK house price growth remained steady in February, with prices increasing by 0.3% during the month, unchanged from January’s reading. Annual house price growth has remained in a fairly narrow range between 3% and 5% since the summer of 2015. This trend was also maintained in February, with house prices up 4.8% over the year, a slight pickup from the 4.4% increase recorded in January. The number of mortgages approved for house purchase increased sharply in January to almost 75,000, up from around 71,000 approvals in December and the highest number since January 2014. However, much of the increase is likely to be related to the impending increase in Stamp Duty on second homes which is due to take effect in April 2016. This is likely to have brought forward a significant number of purchases, which in turn will probably result in a fall back in approvals during the spring/summer. Looking through this volatility we expect the underlying pace of activity to increase in the quarters ahead as improving labour market conditions and low borrowing costs provide ongoing support. “After declining gradually over the past twelve years, the rate of home ownership in England stabilised in 2014/15. However, at 63.6%, this is well below the peak of 70.9% recorded in 2003. If we look at the shift in tenure patterns by age over the past decade, we see a particularly marked decline in home ownership rates amongst the younger age groups, especially amongst 25-34 year olds, traditionally the segment containing most first time buyers. While there was a marginal uptick in 2015, the proportion of younger adults who own their own home (currently 37%) remains considerably lower than ten years ago. Over the same period, the proportion of people renting (either privately or through a local authority or housing association) increased from 43% to 63%. For 16-24 year olds, the proportion renting increased from 73% to 92% over the same period. The increase has occurred in the private rental sector, which currently houses 19% of total households. Over the past ten years, the number of privately rented households has increased by 75% to 4.3 million. The average BTL property has provided an annual return of £22,000 according to LSL property latest calculations. The £22k figure is a 14-month high, equating to a 12% return over the year to January, made up from £13,594 property price growth added to £8,394 of rental income. But before any champagne corks are popped, or non-landlords air stampede into the comments box with their trollish disgruntlement, this figure doesn't include any expenses, mortgage payments, rental voids or other maintenance costs, which would throw up a very different figure. However, overall, the figures remain positive - for now, thanks largely to a chronic UK housing shortage that continues to pump up, both prices and rents. For the last two occasions when my tenants have moved out, at two separate properties in two different Council jurisdictions, I have been liable for paying Council Tax the day after they vacate the property (if no new tenancy take up residency within 7 days) despite both sets of tenants having their Assured Tenancy contract still applying, whether actually within term or in principle rolling on after the term has expired. It appears that the respective Councils are protected by the Law in this regard that the landlord is financially responsible for an un-resided unfurnished property, but why should a landlord have to start paying so soon? This appears to be a very unfair system, especially if it was the tenants who started the dissolution of the tenancy and the landlord was good in the treatment of the tenants. We all know that Councils are currently hard pushed for cash but should this negate the need for fairness? As you know, in the old days the landlord was given up to six months grace in entirety at each rental property before having to start paying Council Tax. Is it possible for you to start a petition or raise on the political agenda to have a fairer compromise situation enacted? If I am missing a trick or I do not have the full facts and can get round this situation, please advise!